Happy birthday banner: single flag size is 16cm x 20cm/6.3" x 7.9"
Excellent quality: these pom poms and banners are made from selected high-quality paper, safe, non-toxic and odorless, to ensure the safety of you and your kids. Simple operation: the set of party supplies is very easy to assemble, you can work with your children personally to participate in making these, and enjoy the fun of DIY. 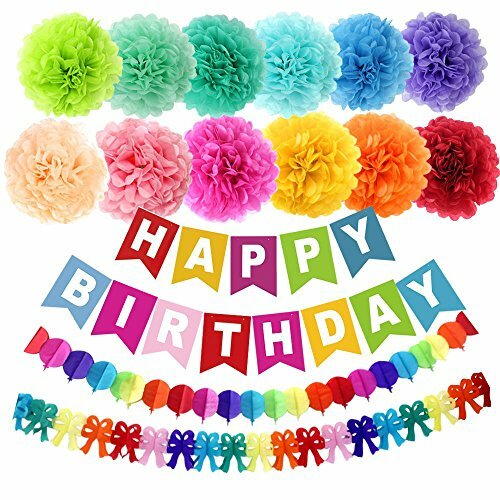 Perfect decoration: These multicolored flower pom poms are suitable for all ages, as birthday party decorations for each kid, regardless boy or girl. You can hang them on the ceiling, wall or garden branches, also to decorate the dessert table. Package contains: 12pcs 10" paper pom pom(12 colors), 1 colorful birthday banner, 2 rainbow paper garland. Product size: single flag of colored birthday banner size - 15cm x 19.5cm/5.9" x 7.68"; single rainbow paper garland total length - 3m/9.8ft. Easy to use: these party supplies are very easy to assemble, you can make these with your child, and enjoy the fun of DIY. Perfect decor: suitable for people of all ages, as birthday party decorations for each kid, regardless boy or girl. You can hang them on the ceiling, wall or garden branches, also to decorate the dessert table. View More In Art Tissue.